The spicy lechon pie (Php 110) was generously stuffed and not too spicy. The pie looks like it's good for one but I think it is best shared—shared with me, haha— unless you're really very hungry. 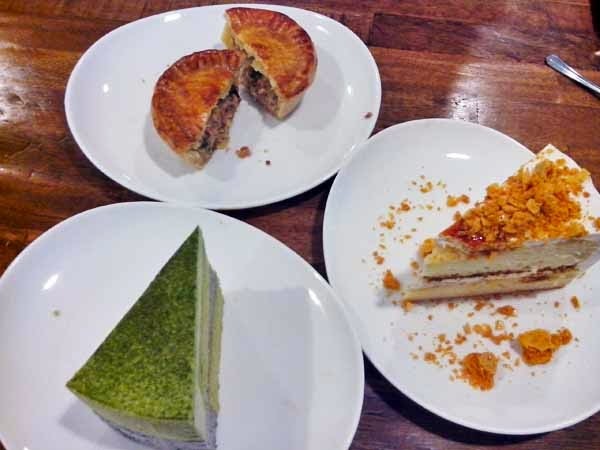 The green tea and black sesame flavors of the green tea black sesame cake (Php 110) were distinct but neither overpowered the other. I think green tea lovers would like this, and green tea haters should still try this—and if they don't like it, they can give it to me. The honey toffee crunch cake (Php 80) was, for me, a winner. Toffee pieces were aplenty, and gave the cake just the right amount of sweetness. But if you have a low tolerance for sweets and your teeth ache from eating this, well, you know who to pass your plate to! All three were such a treat that I want to go back to this street (ok, café) to try everything else on the menu! 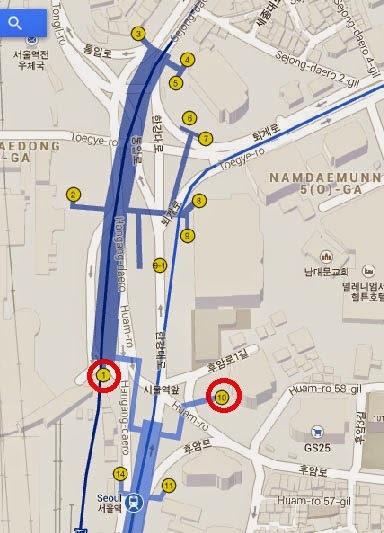 Directions: Take the subway Line 1 to Jongno 5-ga Station, exit 8. Or Line 2 or 5 to Euljiro 4-ga Station, exit 4. Why go: For the food. And for those whose hobby is shopping, go to Gwangjang Market for the silk, traditional Korean clothing (hanbok), and vintage clothing. 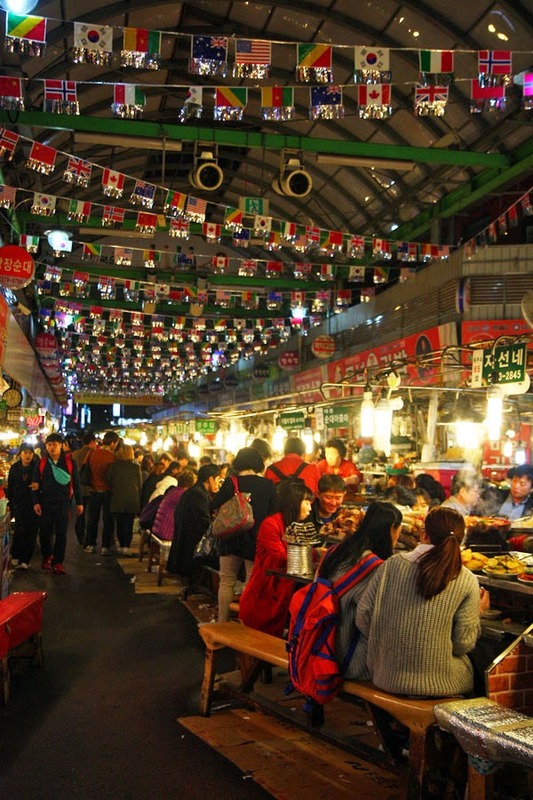 Why not go: Do not go to Gwangjang Market if you're on a diet and/or if your wallet is on a diet. Why we went: Did anyone just say food? When to go: Between 830AM to 6PM for shopping and between 11AM to 10PM for eating. 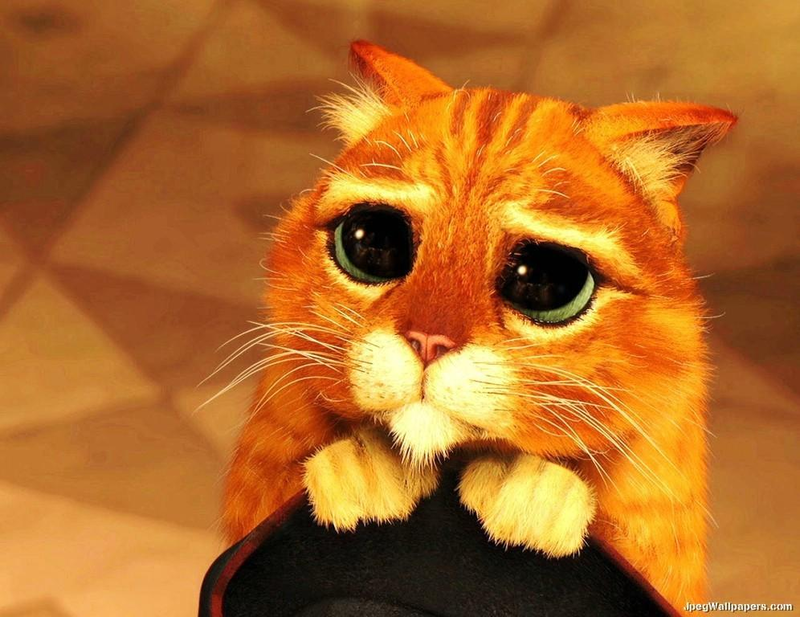 When not to go: When you are full and/or when your wallet is empty. When we went: We arrived at 8PM hungry. Looks like a lot of people were hungry too. Almost all of the stalls and benches were occupied with students, professionals, and couples out on a date. I didn't see any tourists...or maybe I was too focused on the sound and smell of food cooking to notice. What to try: Bindaetteok 빈대떡 or mung bean pancakes (KRW5000). These are made of ground mung beans, kimchi, pork or beef, and vegetables, and served with a dipping sauce made of soy sauce and onions. Bindaetteok is best paired with makgeolli or traditional rice liquor. 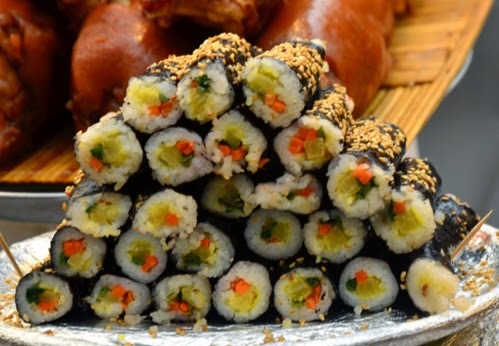 Mayak gimbap 마약김밥 (KRW3000) are small seaweed wrapped rice rolls stuffed with carrots, pickled radish, and spinach. Mayak means drugs or narcotics...but no, these aren't laced with drugs. These are just really addictive. Sundae 순대 or blood sausage...if you dare. Bibimbap 비빔밥, a bowl of rice topped with vegetables, egg, and some meat, and mixed with gochujang (chili paste). Tteokbokki 떡볶이, a snack made with rice cake, fish cake, and very spicy red chili sauce. And all the different jeon or pancake–like dishes you can find in the market. What not to try: What? You're going and not going to try everything? What we tried: Okay, we didn't try everything. 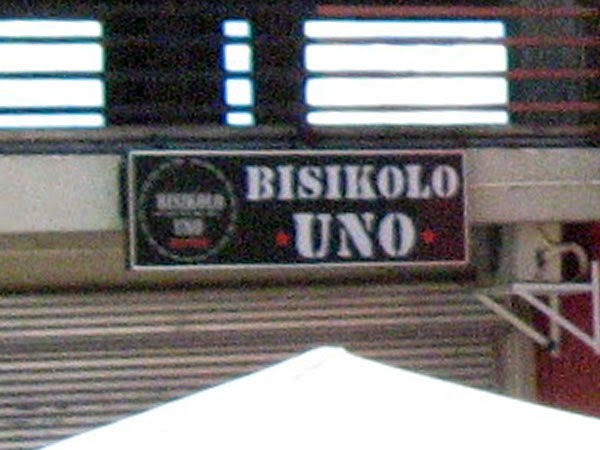 In fact, we only tried the bindaetteok. It didn't look too big but turned out to be quite heavy on the stomach, therefore had no more space to try other stuff. I bought some mayak gimbap for takeout and later on regretted buying just one order. What we were expecting: Dinner. What we did not expect: Conversations in incomplete sentences, laughter, and shared food with strangers. My friend and I squeezed in between a man wearing a black bubble jacket and a man wearing a blue suit. The man in the black bubble jacket scooted a bit to make space for our butts, and before we had settled in, he smiled and started talking to us in broken English. We asked him what was the best food and to answer our question, he ordered bindaetteok for us. Halfway through my bindaetteok, I looked over their plates and eyed green chili peppers stuffed with meat and vegetables (gochu jeon 고추전). My friend could not resist and asked if the green chili peppers were any good. We were to find out as he enthusiastically placed some of his gochu jeon on our plate. Over bindaetteok, jeon, and makgeolli (which he offered but we declined), laughter, smiles, and conversations in bits and pieces, it felt like we were eating with our uncle. Airbnb is a website where one can book accommodations around the world — a bed, a room, an apartment, a condominium unit, a house, a beach house, a tree house, or even a castle. My first taste of airbnb was in Kuala Lumpur: we booked a condominium unit with a view of the Petronas Twin Towers. It was a good experience and good experiences make a satisfied customer, leading me to giving airbnb another shot for the short two–day Seoul trip. 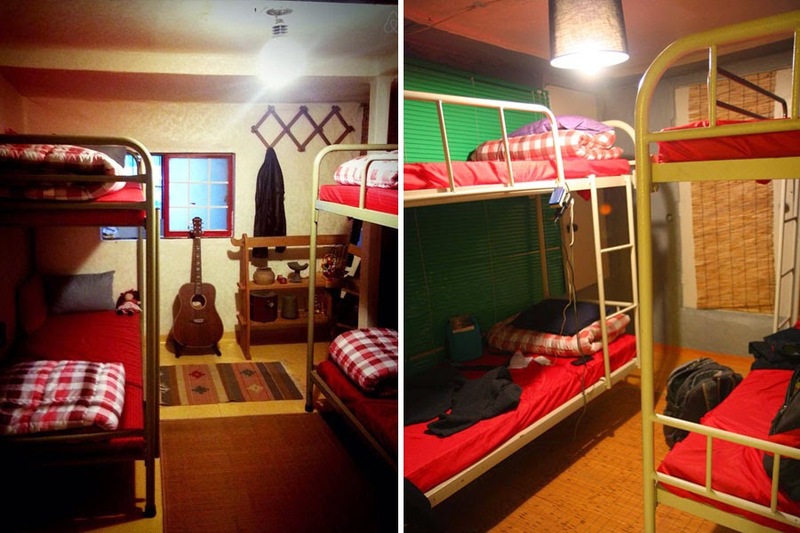 This time just a shared room/dorm bed type near Seoul Station for about US$15 per bed per night. This second airbnb experience was an experience full of lessons. The photo of the room on the listing was not that of the actual room. It was a picture of the shared room in her other property. It wasn't a big a deal—the setup is the same—but I was just wondering why the owner did not bother to use the right photo. Tip: Check the photographs on the listing. Those with the airbnb logo were officially taken by airbnb photographers. 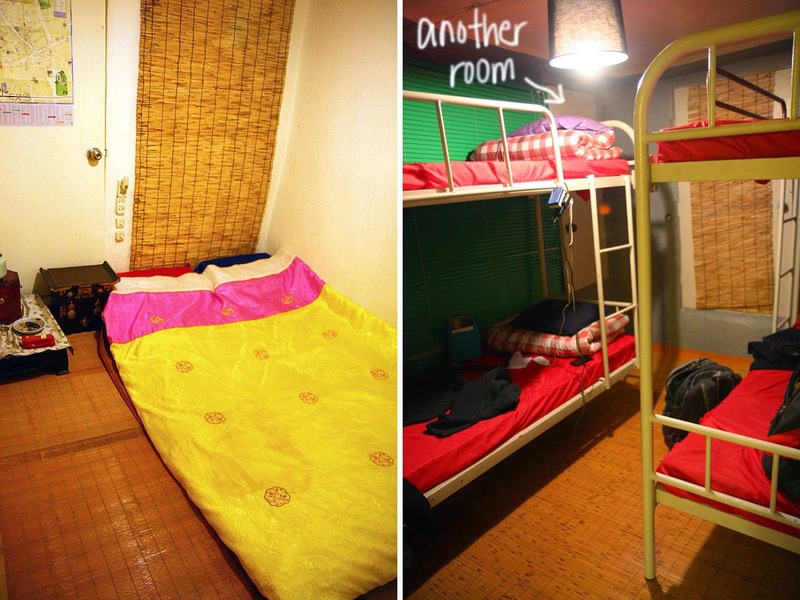 On the left is the photo on the airbnb listing and on the right is the actual room. Lesson #2: Before booking, ask questions. And ask the same questions again. We would be arriving in Incheon a little after midnight, thereby missing the last train (1142PM), so we planned to stay at the airport to wait for the first train (520AM). Since it is stated in the listing that the check in time is 3PM, before booking, I asked the owner if we could go to the house around 6AM to leave our things and freshen up. She said yes, we could. I booked the room. As the trip approached, I asked again about the early arrival, and she said no, we could not leave our bags there and to only go during the check in time of 3PM. Great. We would be stinking on our first day in Seoul. * Oftentimes, the owner of the airbnb listing cannot be at the property all the time, except maybe if he/she is living there. 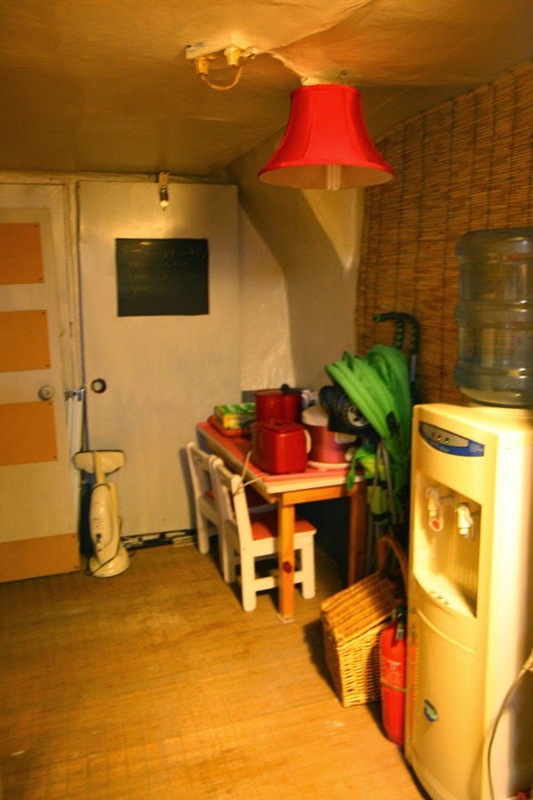 Hostels and guesthouses are more likely to allow guests to arrive early and leave their luggage. * If you choose to sleep and shower at the Incheon Airport, Spa on Air on level B1 of the passenger terminal has sleeping areas, lounges, lockers, shower rooms, and massage services. For a fee, of course. Lesson #3: Before booking, read the reviews. At that time, this listing had only one review and it was positive. Tip: The more positive reviews, the better. Duh. Lesson #4: Finding a station exit (especially for huge stations) is easier underground than aboveground. 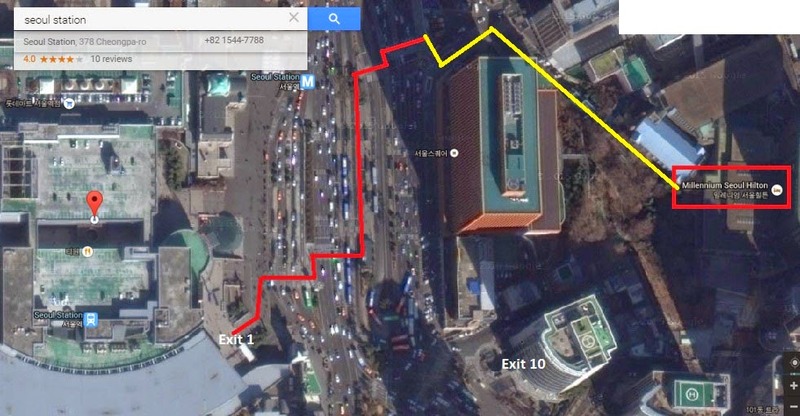 The exit nearest to the house is Exit 10 (just 300 meters). Upon getting our bags from Premium Travel Center (where we had left our luggage for KRW3000 for each bag), we asked the lady manning the Travel Center for directions on how to find Exit 10. We were told to take exit 1 (the nearest exit to Premium Travel Center), and just across the street is Exit 10. We got it loud and clear and did not think to ask to see a map. When we emerged from Exit 1, we were faced with a 15–lane road. It looked intimidating, but we proceeded to cross the street anyway by using the pedestrian lanes, of course. Upon reaching the other side, we did not find any signs of Exit 10. The crossing had brought us far from Exit 10! But we could see Hilton Hotel from where we were and kept walking while keeping an eye on Hilton Hotel (the owner said her place was just across Hilton Hotel). Lesson #5: Be sure to have the address and a clear sketch or map to the property. Upon payment and confirmation of the booking, airbnb sent a message with the address and a placemarker on Google maps. The owner also emailed the instructions....for the wrong property! But she realized her mistake and was able to send the instructions for the property I had booked. I read the instructions (part of which was "My place is located across the street from Hilton Hotel.") and checked Google maps. Looked easy enough. Boy, was I wrong. What she had failed to mention was that her place was not along the street, but in a small alley behind the building that was across Hilton Hotel. This missing information caused us to rob 10 minutes off a stranger's smoke break (he tried to help by checking an online map on his mobile phone but to no avail). And then spending half an hour sitting near Hilton Hotel feeling lost and trying to catch an open WiFi signal to contact the owner through KakaoTalk and to find an online map. * Ask for a sketch or a map from the owner. * Keep the owner's contact information handy. * Rent a pocket WiFi or mobile phone at the airport. Lesson #6: You get what you pay for. 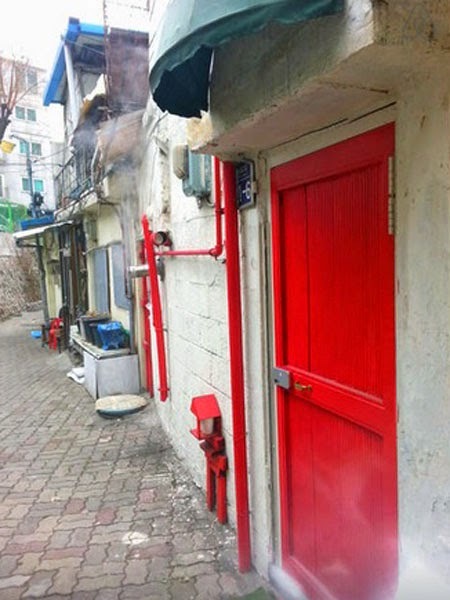 When we finally found the house, we wanted to laugh and cry. Laugh because we had finally found the place. Cry because it was not what we had expected. It looked like a house that was hurriedly patched together with uneven floors and random stuff piled or set aside. It had a shower but not what one would expect a shower area to look like. And the toilet was in a very narrow space...if I was any wider, I would have had to practice good aim from outside the doorway or pee sideways. Overall, the house wasn't so bad, it was just really strange. Oh, and it had no heating (we were there in early November and the outside temperature got to as low as 5°C). * Check the listing for photos of the property. If there is only one photo...think twice. Do your research or take a chance. Before a trip, do research on directions, transportation expenses, entrance fees (if any), operating hours, etc. If you don't or you only remember a place to visit while already on the road, take the chance. I had left all the Batangas trip planning to my Batangueño friend. He did research on all the pertinent information, but only remembered Mabini Shrine when we were on the way to Lipa from Laurel. We decided to give Mabini Shrine a go, only to find out it was the day they close for the week (Monday). All we could do was press our face between the bars of the gate and project our inner Puss in Boots, but, of course, to no effect.